The holidays are here, and there is so much to love about this busy, joyful season. Those who celebrate the great miracle of Hanukkah are preparing for the festival of lights, which begins at sunset this Sunday, December 2. In the days leading up to Christmas, people are unpacking decorations and beginning their holiday shopping. Kwanzaa carries its own set of family traditions — this year, the celebration of African-American heritage falls between December 26 through January 1. 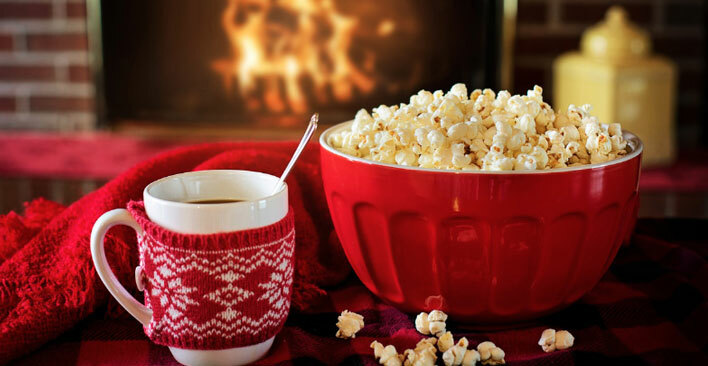 This time of year brings people together to fill the winter nights with holiday traditions of food, festivity and fun. The soft glow of candles creates a soothing, contemplative environment. 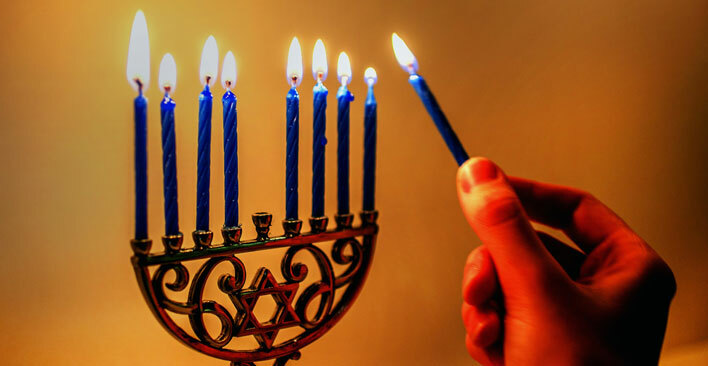 Whether we light a menorah for each night of Hanukkah, the mishumaa saba during Kwanzaa, or pine-scented votives, we burn candles more often during the holidays. We also tend to have paper or other flammable decorations around. Don’t place lit candles close to anything that can catch fire, and don’t leave them unattended. As the Christmas carol goes, “there’s no place like home for the holidays.” For those with far-flung families, traveling is a holiday tradition. While it’s wonderful to see long-lost loved ones, being on the road or running through airports can be stressful and chaotic. When traveling, anticipate delays, and try to stay calm. Take care lifting heavy luggage – use carts or get help loading them into your car. You don’t want to spend Christmas time with a back injury. If traveling to a snowy destination, take care walking in the ice and snow to avoid a slip and fall injury. Before you leave, take some security precautions to prevent a burglary. Hold your mail and newspaper deliveries, or ask a friend to pick them up. Put timers on your lights or have a neighbor or house-sitter come by to make your house look less vacant. There’s nothing like a toasty fire on a wintry night as you tell Christmas stories or the story of Hanukkah — but only if you’re not choking on creosote or carbon monoxide. Be sure to have your chimney swept at least once a year to prevent hazards like a chimney fire, or inhalation of dangerous toxins. If your fireplace has been dormant for much of the year, check your smoke and carbon monoxide alarms before that first fire of the season. Burn seasoned hardwood only – don’t burn wrapping paper, which can flare up and burn hands, arms or fingers. Use a good fireplace grate or screen to prevent sparks from flaring. Whether or not your Christmas light display rivals Clark Griswold’s, you can avoid a Christmas Vacation-like disaster by using only electrical decorations with an Underwriter Laboratories (UL) label. Before you begin your holiday decorating, inspect your lights for frayed cords, bare/loose wires, or damaged sockets. Be sure to use indoor and outdoor lights appropriately. Don’t plug more than one extension cord into an outlet, or connect more than three strings of lights. Overloaded electrical are a common cause of holiday fires. When putting up your lights and decorations, don’t do it alone – have someone there who can call for help if needed. Use a proper ladder – know the recommended weight limit, and make sure the rungs are dry and unbroken. Set it on solid, even ground, and test it for sturdiness before climbing. Don’t allow children to climb it, and take it down when not in use. If you’ll have a live Christmas tree, water it daily – dry trees can create a flashover in seconds; a well-watered tree burns much slower. Turn off or unplug all decorations when you’re not home, and when you go to bed. Everyone has a memory of a special gift, whether it was opened on Christmas morning or during one of our Hanukkah celebrations. Holiday presents can bring tears of joy or laughter. Avoid tears of pain when opening gifts this year: to open shipping cartons or hard plastic packaging, use the correct instrument – which is NOT a kitchen knife. Use a box cutter, scissors or package-opening tool. To select presents that are safe for children, pay attention to the suggested age on the toy’s packaging to ensure the child can enjoy the gift safely. Even dreidels can be dangerous – the tiny spinning top can be a choking hazard for toddlers, so use caution when celebrating that Jewish holiday tradition. Unfortunately, when it comes to shopping for holiday gifts, theft is one of the more unwanted Christmas traditions. 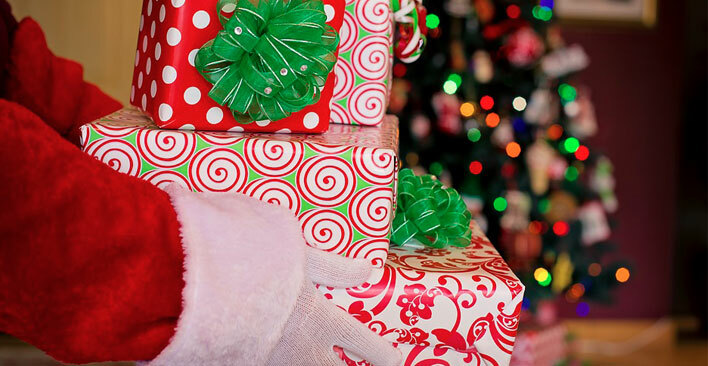 Some safety tips for shopping: Keep a secure hold on your purse and/or packages. If you need to use an ATM, choose one that is in a well-lit, secure location. Stay aware of your surroundings and the people near you. If possible, shop during daytime – if not, park in a well-lighted area as close as possible to your destination. Lock packages in the trunk or out of sight. To avoid identity theft, shop at legitimate sites through a private, secure network (such as those with an “https” in the web address). Avoid opening new retail credit accounts. Use cash whenever possible, especially if you’re shopping at a new or unfamiliar retailer. If you aren’t typically home to receive packages during the day, consider having them delivered to your work, to a neighbor, or to a smart locker. Many of our holiday traditions involve holiday treats and celebratory meals. There’s a reason people gain an average of 1.3 pounds over the holiday season, and it’s gorging on gelt (chocolate coins), chomping Christmas cookies, or scarfing on soul food. Meal preparation can be a holiday hazard as well, whether you’re frying latkes or a turkey. When preparing your holiday feast, never leave cooking food unattended. Keep a pot lid handy to cover a containable fire, and have a kitchen fire extinguisher handy, just in case. AND, if you are frying a turkey, never do it indoors. Take extra care when preparing food or carving meat. To avoid a nasty cut, place your food on a sturdy, non-slip surface and carve away from your hands or body. Food poisoning is always a concern, especially with under-cooked turkey or meat. To avoid this, store your food at the right temperature (in the refrigerator at 40° F; in the freezer at 0° F), and invest in a quality food thermometer to cook your meats to the right internal temperature. When preparing food, wash your hands often to avoid cross-contamination, and store leftover food within two hours of serving it. 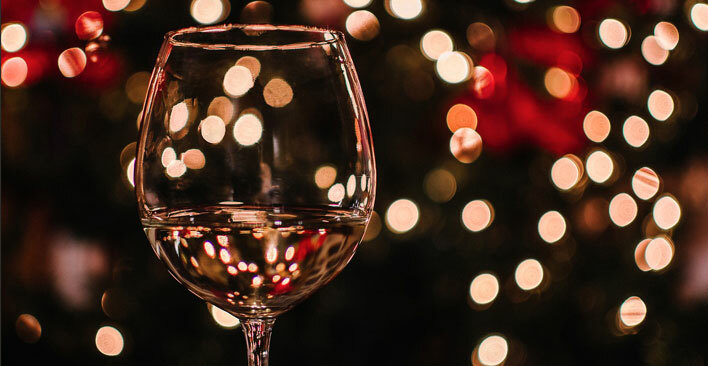 Most of us will attend at least one holiday party this year — celebrating Hanukkah traditions may mean eight crazy nights. Sadly, most holiday deaths are due to vehicle accidents caused by drunk drivers. If you plan to consume eggnog, glögg, Manischewitz, or any other intoxicating substance, please use a designated driver, taxi or ride share service. Driving is not the only way to hurt yourself when under the influence. Other alcohol-related holiday injuries include: falling from a ladder while decorating under the influence; and spraining your ankle when rockin’ around the Christmas tree in 4-inch heels. TorkLaw wishes all our friends, clients and colleagues a safe and happy holiday season. We encourage you to make holiday safety one of your family traditions. If you need us, we’re here: call us at (888) 845-9696.